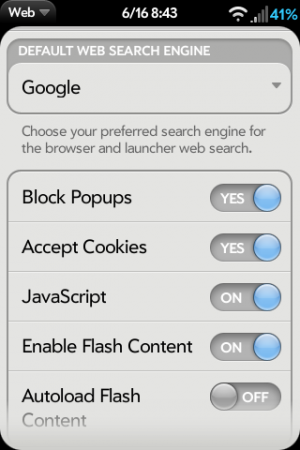 Starting with webOS 2.0, Adobe Flash is now available in the browser. Using and interacting with Flash content works rather well in webOS, but you should be aware of some settings that are available to you that affect Flash. In the Browser Preferences window (accessible by swiping down from the top-left corner while in the browser and selecting "Preferences"), there are 2 new options that relate flash. Adobe also provides a website that give you some additional options for controlling applications in the Flash Player, including some local storage options (allowing apps to save data to your device) and asking if you want to enable peer-assisted networking. To access these settings, visit https://settings.adobe.com/flashplayer/mobile/ from the browser on your device.